Growth forecasts for next year have been revised down for most of the world’s major economies. Global GDP is now expected to expand by 3.5% in 2019, compared with the 3.7% forecast in last May’s Outlook, and by 3.5% in 2020. In many countries, unemployment is at record lows and labour shortages are beginning to emerge. But rising risks could undermine the projected soft landing from the slowdown (emphasis added by me). Trade growth and investment have been slackening on the back of tariff hikes. Higher interest rates and an appreciating US dollar have resulted in an outflow of capital from emerging economies and are weakening their currencies. Monetary and fiscal stimulus is being withdrawn progressively in the OECD area. The shakier outlook in 2019 reflects deteriorating prospects, principally in emerging markets such as Turkey, Argentina and Brazil, while the further slowdown in 2020 is more a reflection of developments in advanced economies as slower trade and lower fiscal and monetary support take their toll. (OECD source here. The sell-off in global equites certainly had a cause and is not a capricious event. It can be laid at the feet of slower expected growth and of trade tensions that had been expected to be cooling around this time of year instead of upping the pace of the boil. The U.S. and China continue to have as fractious a dialogue as ever over trade. There is no sign for any progress being made as growth prospects seem to fade. Meanwhile, the geopolitical back drop has been worsening. China continues to build out on the South China Sea space it has claimed. North Korea has not made any further conciliatory moves. And while there are no statements on the matter, it seems to have dug in on making any more progress toward denuclearization until it gets sanctions relief. The U.S. has ‘played that game before’ with North Korea and has had too many times when that backing-off has resulted in the U.S. not passing ‘Go’ and not collecting its $200. So the U.S. has said there will be no relief until there is denuclearization. As a result, that matter seems to be in stasis. Statements by U.S. President Donald Trump continue to offer rhetoric on the matter that has remained positive. Still, as we all know, that rhetoric can shift on a dime. Oil prices are currently falling rapidly as President Trump has been slow to connect the dots and follow the breadcrumb trail from the Saudi Turkish embassy to the Crown Prince in Saudi Arabia who has been named by the U.S. CIA as the likely source of the ‘kill order’ for Mr. Khashoggi. In what has become an odd sequence of events, Mr. Trump seems to acknowledge the trail of evidence but concludes that we will probably never know for sure then almost in the same breath he lauds the Saudis for pumping oil and giving Americans something like a tax cut for Christmas in the form of lower energy prices. The world has become a strange interconnected place, but there is more than just that strangeness. In Germany, Angela Merkel has condemned as ‘nationalists,’ those who opposed a UN agreement on migration. Angela a German lives in a country buffered from the direct influx of migrants because of deals she helped to broker to shut the borders in surrounding countries to the flow of migrant traffic. She lives in a ‘Union’ that condemns migrants to stay where they enter until they are processed. This has spared Germany from housing transition migrants and piled them up, instead mostly in Greece and Italy, two countries that can least afford the imposition. As for ‘nationalism,’ Germany with the best finances in the euro area is doing nothing to add to stimulus in the euro area that is in great need. Instead, Germany is running a fiscal surplus to reduce its debt and yet has continued to shun the U.S. requests to make a more substantial and warranted contribution to NATO, that protects us all. Nationalism? Has Angela lost her mind or is she devoid of the gene that permits introspection? On the pure economics front, we present data for the OECD to demonstrate the facts of the current situation. We more commonly show data for the U.S. or for EMU or for large country EMU members, or for the U.K., Japan or China. But this dataset is for quite a large share of global GDP and tells the evolving story quite well. Inflation in the U.S. and the EMU shows more of tendency to have topped than does the OECD dataset for overall trends. 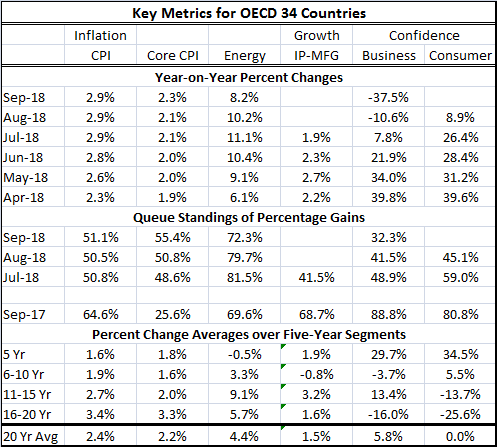 On growth rates for the underlying data in this table, the queue or rank standings of current year-on-year percentage changes show the following: the CPI and core CPI for the OECD are near a 50% standing (the 50% mark identifies the median for this ranking). Since 1998, the unemployment rate in the OECD area has been lower less than one-half of one percent of the time. Manufacturing IP growth has only a 41st percentile standing since 1991. Still, consumer confidence has a weak 45.1 percentile standing and business confidence has a lower 32.3 percentile standing. Compare to one year ago, all percentile standings are weaker except for core CPI and energy inflation. The problem here is that soft landings are hard to achieve in economics. Policymakers talk of soft landings when data grow soft; however, often soft landings are spoke of, hard landings or crash landings are more common by far. So as the economy- the global economy - shows signs of slowing, there is NOTHING being done ANYWHERE to preempt or slow the process. The recent stock market selloff is both a signal and a mechanism for a harder landing since such voracious decline in equity prices gobbles up wealth and destroys confidence; both of which lead to weaker growth. In the U.S., the Federal Reserve officials have talked a lot of neutral and they even provide an estimate of the proper long-term Fed funds rate (2.9%). But in their speeches, they are much more equivocal about what neutral is and their ability to know it. Yet, Fed policymakers continue to warn of the need to get the fed fund rate up to and probably North of neutral. Yet, after all but admitting that it is blind in a blizzard with a broken compass, it has struck out on policy path that it calls data dependent, but one that does not seem to want to shift as circumstances change. We will have to wait for more news on that one. Optimists say that if the economy weakens the Fed won’t continue to hike rates. They say rates will only rise if the economy remains strong. But that is actually a statement about what will be based on the Fed’s perceptions of those things. And Fed’s perceptions have not been very good and yet the Fed’s ability to carve out a policy path it is willing to stick to through thick and thin has been heroic. For its part, the ECB is in a similar fix but with a less clear policy path. Japan has the accelerator glued to the floor. And in the U.K., the BOE is in waiting on Brexit. Happy Thanksgiving, and good luck one and all! I hope that we fare better that the turkeys this holiday season.